I’ve been thinking for some time what is the best streaming device that fits my budget. Roku, Apple TV, Amazon Fire Stick/TV, and Google Chromecast are few of my choices. I chose Chromecast because I like Google in general but will I like it’s streaming device? You’ll find out soon along with the tips I discovered as I go through the challenges all in the name of binge watching . . . and educational pursuit (so not to feel guilty). Simple setup: plug into an HDMI port and connect to Wi-Fi. Sounds simple. Straightforward. so simple. This will only take about 15 minutes. NO. Make it 10 minutes. I followed the “Getting started;” anyway it’s plug and play. Right? The instructions are verbatim copy of the manual. Plug power cable into Chromecast. Switch TV input/source to the HDMI port your Chromecast is plugged into. Five steps away from streaming your favourite movie. That’s what I thought but I was stuck in step #5. Did I say 10 minutes? Multiplied to three or more, that’s how long I had to figure out how to install Google Chromecast. I used my iPhone then iPad. I browsed http://chromecast.com/setup on Safari and Chrome to no avail. I didn’t find direct answers other than the procedures similar to the manual. But out of frustration and online sleuthing something lights up in my head. Install Google Home on your iOS device. This was the simple trick. Visiting the link http://chromecast.com/setup didn’t help me at all. Finally, my phone was casting a TED talk on the TV! I installed the app both on my iPhone and iPad. OK so we may not have the same interest; fortunately, Google redeemed itself with the list of apps you can install and cast through Google Chromecast. From games, news, to music, there are lots of choices that you have to check the available storage on your device. Indeed, Google Chromecast is easy to set up if done the right way. Even the device that doesn’t have a Google Home installed can cast shows on the TV that I have to unplug it when not in use. Although I had difficulty in the set up, I like how easy it is to cast shows especially from YouTube. But I’m not keeping my Chromecast. My equally nerd sister is happily waiting for it. Why a sudden change of heart? I like the device per se but not the process. In the future, I would like to use a streaming device with remote instead of my mobile device. And if I had any trouble again, I’ll definitely write about it. 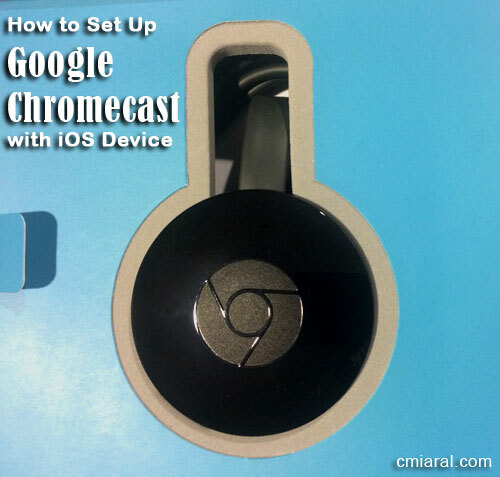 What about you, how are you able to set up Google Chromecast? Any favourite apps or shows? Leave a comment.